Discover Ancient Ayutthaya with a Chao Phraya cruise in Bangkok. Discover the wonders of Ayutthaya Historical Park, a UNESCO World Heritage Site. The ancient capital city of Ayutthaya was founded in 1350 by King U-Thong, and it was from here that the Siamese ruled their kingdom for 417 years. Today, the ruins of this majestic capital are a world-famous tourist attraction. Discover the park's most important sites, including Wat Phra Si Sanphet, Wat Ratchaburana, Wat Mahathat and the stunning Summer Palace. Manohra Chao Phraya Cruise Bangkok offers you the opportunity of exploring the world heritage site on foot or by bicycle. In 400 years, Ayutthaya went from a prosperous trading and political capital to a city left in ruins. The city was under a constant power struggle with neighbouring Burma. Nevertheless, it remained a booming centre for regional trade and a burgeoning metropolis where art and culture flourished. With economic prosperity, Ayutthaya’s kings poured the kingdom’s wealth into the construction of temples and religious monuments. Exhibiting sophisticated techniques and styles, Ayutthaya’s architectural heritage is an amalgam of Lopburi, Sukhothai, Dvaravati, U-Thong, ancient Khmer and Persian styles. 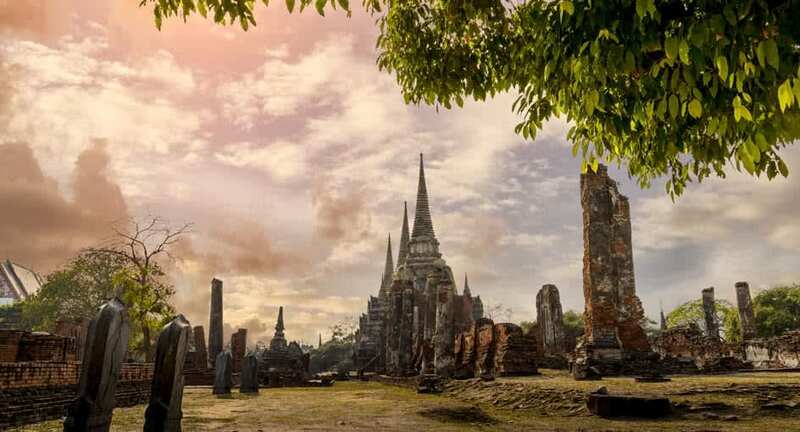 Today, Ayutthaya’s temple and palace ruins serve as a powerful reminder of Siam’s glorious past, as well as haunting memories of one of the most turbulent periods in Thai history.